Page 1: Soquel, California: Sri Gaura Purnima 2005. I offer my respectful obeisances unto Sri Chaitanya Mahaprabhu, Lord Nityananda, Sri Advaita, Gadadhara Pandit, Srivas Thakur, and all the devotees of Lord Chaitanya. Sri Chaitanya Mahaprabhu is always accompanied by His plenary expansion Sri Nityananda Prabhu, His incarnation Sri Advaita Prabhu, His internal potency Sri Gadadhara Prabhu, and His marginal potency Srivas Prabhu. He is in the midst of them as the Supreme Personality of Godhead. 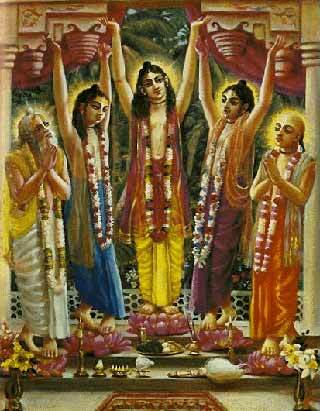 One should know that Sri Chaitanya Mahaprabhu is always accompanied by these other Tattvas. Therefore our obeisances to Sri Chaitanya Mahaprabhu are complete when we say, Sri-Krishna-Chaitanya Prabhu Nityananda Sri-Advaita Gadadhara Srivasadi-Gaura-bhakta-vrinda. There are ten offences in the chanting of the Hare Krishna Maha-mantra, but these are not considered in the chanting of the Pancha-tattva Mantra, namely, Sri-Krishna-Chaitanya Prabhu Nityananda Sri-Advaita Gadadhara Srivasadi-Gaura-bhakta-vrinda. 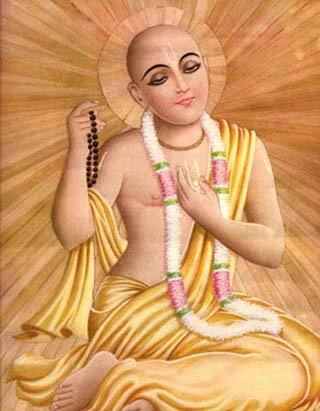 Sri Chaitanya Mahaprabhu is known as Maha-vadanyaya, the most magnanimous incarnation, for He does not consider the offences of the fallen souls. we must first take shelter of Sri Chaitanya Mahaprabhu, learn the Pancha-tattva Mantra, and then chant the Hare Krishna Maha-mantra. That will be very effective.